What timing: Just a day after Microsoft announced the Surface Pro 4, HP is unveiling a similar-looking 2-in-1 of its own. Though HP has made laptop/tablet hybrids before, the new 12-inch Spectre x2 is one of the few from the company to rock a built-in kickstand, à la Microsoft's tablet. Far from being just an imposter, though, the x2 sets itself apart in several key ways, with a more adjustable kickstand and a sturdy, potentially more comfortable keyboard. Oh, and that keyboard actually comes in the box (ahem, Microsoft). With a 12-inch display, the x2 is roughly the same size as the last-gen Surface Pro 3, and weighs 1.85 pounds (the new Surface Pro 4 weighs less, ranging from 1.69 pounds to 1.73). Also like the Surface's stylus setup (likely based on N-trig tech), the x2 works with a pressure-sensitive Wacom-made active pen, although in this case, it's sold separately. 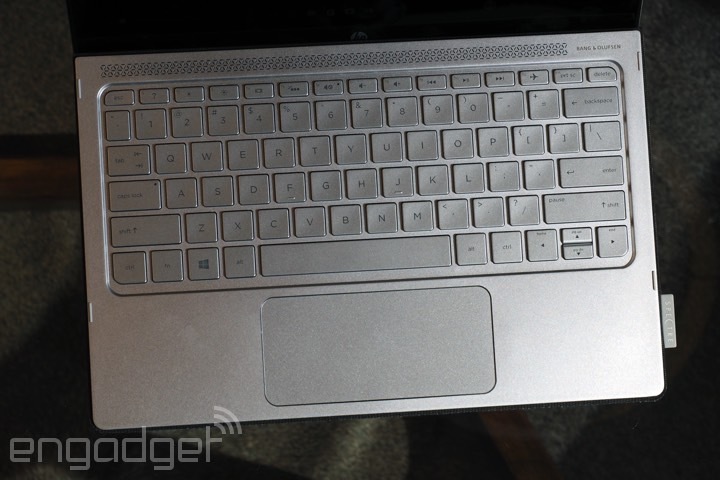 So far, then, the general concept is the same: a thin and light tablet that magnetically clicks into a keyboard cover. The biggest difference lies in the design of the hinge. Whereas the Surface's kickstand is flush with the chassis, the x2 has a U-shaped, easel-like frame that pops out when you press a release. The benefit here is that it allows the tablet to have a thin 8mm-thick profile (just slightly thinner than the SP4) and can be arranged at any angle. Though it is indeed versatile, I quickly found in my demo that it wasn't any easier than the Surface to balance in your lap. As for the keyboard, the keys here are far more substantial than what you'd otherwise get on a product like this. Specifically, the buttons have 1.5mm of travel, making them nice and cushy, and they're backed by a sturdy panel and palm rest that doesn't flex or bend under pressure. In my short time with the device, I made all but one typo -- otherwise, my typing was flawless, if I do say so myself. As a bonus, the touchpad is quite spacious too. Just keep in mind that the price of a more substantial keyboard is more substantial heft: Though the tablet itself weighs just 1.85 pounds, that weight balloons to 2.69 pounds with the keyboard attached. Also, the Surface Pro 4 now has a new (and supposedly sturdier) keyboard, so this might be less of a differentiating point than HP thought it would be. Again, what's nice is that the x2 starts at $800 with the keyboard included in the box, as opposed to being sold as a separate $130 accessory -- something Microsoft's gotten away with for years. Meanwhile, the Surface Pro 4 not only comes without the keyboard, but also starts at $899 with the same RAM and storage, nearly a hundred bucks more. All told, then, it has the potential to be a good deal, but that lower total price comes somewhat at the expense of specs. In particular, the display tops out at 1,920 x 1,280 resolution; though that's probably fine for most users, it's still lower than the 2,763 x 1,824 offered on the SP4. On the inside too, the x2 makes do not with new sixth-gen Core i5/i7 processors, but sixth-gen Core M chips instead. (Although it's worth noting the base SP4 also comes with a Core M chip.) As we've found in our own reviews, Core M is lower-powered than more robust Core-series CPUs, but doesn't actually offer a big advantage in battery life. Speaking of the sort, HP is promising 10 hours of runtime. The Spectre x2 starts at $800. All models come standard with a Verizon-compatible LTE radio, though you'll need to either purchase a data plan or add it to an existing one. That means if you otherwise use AT&T or some other carrier, you can just ignore that bit.